Kutina Chaka / Returning bridge. In 80s and 90s decade thousands fled from their homes to refugee from Sendero Luminoso’s and army’s violence. From Oronccoy and Chungui in Ayacucho people crossed the Pampas river to the Andahuaylas province in Apurimac. As a reprisal, Sendero Luminoso destroyed the bridge. Disposed to don’t be afraid, Ayacucho’s people who were living in Andahuaylas streets helped by Eutropia Medina, Mark Willems and their NGO, decided to build a bridge to begin their return and claim them from terror. 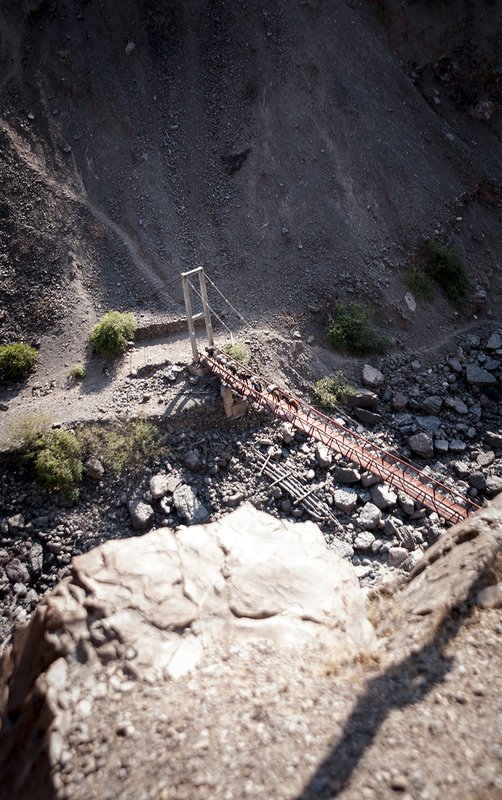 In 1996 a precarious bridge was built. Each year at the end of august it is held a celebration in that wilderness space where people from Ayacucho and Andahuaylas come down to fulfill memory with live and to exchange their products in the agroecological fair of Kutina Chaka. I’ve been working in this project three years now. Actually I’m looking financing to develop a meticulous archive that documents all the process since the 90s until nowadays with the objective to propose it to the Peruvian state as a patrimonial cultural practice.